Candidates in the Nov. 5 election for 49th District State House of Representatives were guests at a political forum hosted by the West Flint Business Association. 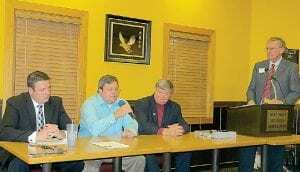 They are (left to right) Don Pfeiffer, Republican, Phil Phelps, Democrat, and Pat Clawson, Libertarian. FLINT TWP. — Should Flint Township change its name to distance itself from problems associated with the City of Flint? How can you assist Flint Township in financial growth and stability and what can you do to add more jobs? What are your thoughts on the impact of the Right to Work law on local businesses? Do you support consolidation of local government? Why does Flint need to join the new water pipeline and why are we changing the way the Flint water plant is operated? Those questions and more were posed to three candidates on the Nov. 5 ballot vying for the 49th district House of Representatives seat vacated in May when Jim Ananich was elected state senator. The 49th district is made up of Flint Township, Flushing City, Swartz Creek City, Mt. Morris City, Mt. Morris Township and part of the City of Flint. 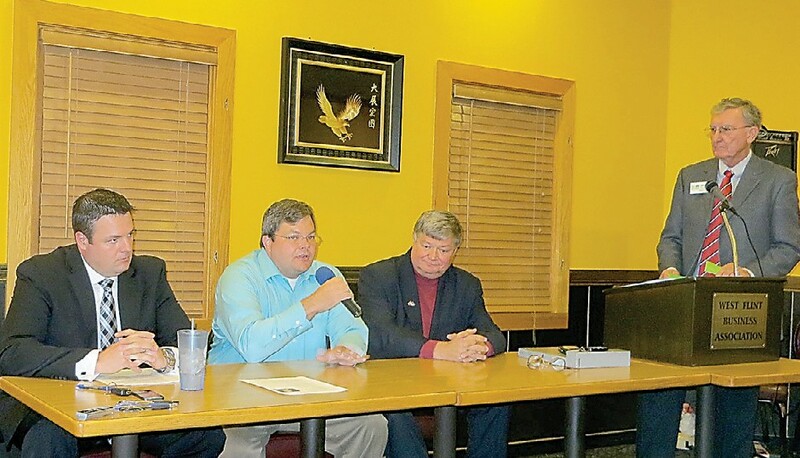 Phil Phelps, Democrat, Don Pfeiffer, Republican and Pat Clawson Libertarian spoke last week at a forum hosted by the West Flint Business Association. Pfeiffer spoke against a Flint Township name change and Clawson said it should be decided by a vote of the people, not elected officials. Phelps arrived late to the forum due to a work conflict and did not respond to this question and several others. Pfeiffer called Flint Township is the “business arm” of Flint were city residents come to shop. Flint is struggling with its image now but Pfeiffer said that it can again become a place Flint Township is proud to be associated with. Clawson said the best way to boost financial growth and stability in Flint Township is to first resolve crime spilling over from Flint. He also said that the government needs to get out of the way of small business operations and level the playing field so that private enterprise can take root. Pfeiffer said it is hard for a legislator to single out benefits for Flint Township separate from the district as a whole but lower tax incentives is one of them. He agreed that security in and around Flint has to be dealt with before investors feel safe about starting or expanding businesses here. Pfeiffer and Clawson both expressed support for government consolidation. Pfeiffer said it was one of his platforms when he ran for Flint Mayor last year. He said he advocated merging 911 operations which is now taking place. Pfeiffer and Clawson both generally spoke favorably about Right to Work. Pfeiffer said it has not done any harm and is proving itself to be a viable option. Clawson said he’s open to seeing how and if it works but does not think it will be a panacea many think it will be. He also said he would not support repealing the law. Pfeiffer said he opposes building the Karegnondi pipeline because he does not believe it will bring lasting relief from high water rates to Flint residents. “The numbers show that if we can lock down the rate and keep it at the same level we won’t have to continue to see the increases we are getting from Detroit,’’ he said. Clawson said he is neutral about the Karegnondi pipeline because he still has unanswered questions such as how land is being acquired and what safeguards are in place to prevent corruption like that seen in recent years with the Detroit Water and Sewer division that led to higher water rates. In closing, Clawson said Flint is an example of decades of Democratic rule and Republican leadership in Lansing is an example of the legislature running roughshod over the will of the people. Libertarians support the power of the individual, he said. Pfeiffer said that as member of the majority party in Lansing he said he will be more effective in working to restore economic well being back to the area. He urged voters to cast their ballots in favor of issues and not party affiliations. He alluded to his background as a whistleblower on grant money misspending by a company he worked for that cost him his job, his home and two years of his time spent in litigation.